This article will guide you in your search for the best razor for men. Not only will we look at popular razors, but also some that you might not be aware of. If you have been shaving for a while now, you already know that it is not a simple process like scruffy guys in movies and adverts make it out to be. Shaving (and by that we mean proper shaving) requires patience, experience, and technique. In addition to this, you would need to acquire the proper tools for the job. It is unheard of for a professional painter to settle for cheap paint and brushes while handling a painting project and still expect to get a clean and professional look. Similarly, you should not count on getting a clean shave while using poor quality tools. This cannot be stressed enough. To help you get these proper tools, we have compiled a list of the best razors for men available on the market. Our Editor’s Choice award for men goes to the Feather AS-D2 – but in addition to product reviews, we provide you with some shaving tips to guide you through a comfortable, clean and nick free shaving session. The buying guide included is also designed to help you make an evaluation of options not reviewed in this list. Before we get our hands dirty with reviews of several high-quality options available on the market (if you are too eager you can jump to the reviews section), it is important that we go through some factors to consider while making a purchase. It is no secret. The market is flooded with them. They come in all kinds of shapes, sizes, features, and efficiency. Ideally, having many options is a great thing. But when you have too many products to choose from, you easily get dizzy and confused. And no, TV ads do not make the choosing process any easier. If anything, with the marketing strategies most brands and companies employ consumers are left stranded and, sorry to say, too often misled. For this reason, it is important that you are equipped with the knowledge of what makes the best razor for you. The product you choose should always suit your personal lifestyle and schedule. This is by far the most important decision any man looking for a razor can make. They come in five main types. These types include electric, disposable, straight, cartridge, and safety. The type you choose depends on your need, use, and budget. Bear in mind that each of the 5 has its share of pros and cons. Here is a breakdown of what they each have to offer. We all have tried them, right? Maybe you had your first experience with one as a gift when you were around 15-16, I know I did! Well, they have come a long way since then! They are available as 2 basic types – foil or rotary. Rotary shavers are a good choice if you have a medium to coarse or a long long beard/ hair, while most men find that foil shaver is a better pick if you have sensitive skin. In addition, you can choose between a cord – or cordless. To pick one for your specific needs depends on a several of factors, such as flexibility and convenience (this is something that cordless shavers provide you), and if you are okay with relying on battery power that (as we all know) needs to be recharged. In my opinion, cordless shavers are in my opinion better if you are traveling. Under this category, double-edged safety razors are the most common. This particular safety razor features a blade firmly locked in place. The blade is positioned on the head of the razor such that it only exposes the tip of its edge. This design works well in preventing cuts, ‘safety’. Overall, safety razors prove easy to use. They are ideal for beginners and are popular with experienced shavers as well. The only downside to this type of razor is the fact that the blade is locked in place and only the edge is exposed. This design inhibits control of the blade which makes it difficult to shave in some hard to reach areas of the face. Cartridge razors are bought separately from the blade. Just like other products, the quality of these shavers varies depending on the brand. However, some of the leaders in the industry will provide bearded men with a close shave without experiencing cuts or nicks. The only disadvantage is that in the long run, using cartridges will cost you a small fortune. This is especially if you make it a habit of buying direct from stores. Straight edge razors are the ancestor of all razor types. They are what your great-grandfather used to trim his beard. This shaving tool is centuries old and most even consider it a vintage tool brought back to life in the 21st century. Today, they are not used by many men. But this does not mean that they are not effective. On the contrary, they are. The challenge in their use is in learning the technique, including the time and patience required. Improper handling could have you bleeding all over your bathroom sink. Finesse and experience are important when using this type of razor. But once you get a hang of it, you will shave like a badass and your friends will respect you. After all, very few men today have mastered the skill of using straight razors. Disposable razors are the kind that is thrown away after use and when the blade grows dull. They are not expensive. For this reason, most men can afford to buy them in bulk. They prove convenient when one is on the road. However, when considering this type of shaver, bear in mind that you always get what you pay for. Most men prefer shaving in the morning. This time proves to be convenient for many. But for those who are always in a hurry, the shaving process usually isn’t perfect and as clean as one would want. The different razors mentioned above also perform differently when used in a hurry. The best razor to a quick shave is a cartridge razor. Straight and safety razors, on the other hand, require more time, concentration, patience, and effort. If you have skin that gets irritated easily, then a safety razor is your #1 bet to getting a clean and smooth shave. Cartridge razors will do you more harm than good if this is your condition. The multiple blades on multi-blade cartridges remove a lot of skin. The recent cartridges, however, feature inbuilt lubricating systems which help to provide a smooth shave for sensitive skin. For most men, the handle is always an afterthought. But this should not be the case. The thickness and comfort of the handle will affect your shaving technique. Also, with regards to the handle, you should consider the texture of the handle. It should provide you with a secure grip. The last thing you would want is for your razor to slip from your hand while gliding it over the skin. The cost of razors varies greatly depending on the features and quality. While there are cheap and expensive pieces, always bear in mind that you get what you pay for. That said, while costly versions may set your back some serious cash initially, owing to their durability they will save you a great deal in the long run. And with that, let’s now get started on the reviews so you can pick the best razor for men that fit your needs. Feather Seki Double-edge is a safety razor designed in Japan. It is made from stainless steel and is famous for its sharp blades. The blades of this razor perfectly matched to the very well designed body are a major selling point. That said, it has other notable features that make it perfect for sensitive skin. In comparison to other units, it is expensive. But with all it has to offer, it is a bargain for most. The fact that the unit is made from stainless steel means that it is durable. It does not tarnish or lose its original appearance. The razor is built to last for ages. When the blade becomes dull, all you need to do is replace it with a new one. The blades are sharp. But even then, the razor is considered less aggressive in comparison to other top razors. You can exert additional pressure while shaving without worrying about getting nicked or irritating the sin. If you have sensitive skin, this is perfect for you. Its grip – it has a knurled handle. The knurling features horizontal grooves. This provides a superior grip. The handle features 6 grooves. Three are located at the top and three at the bottom of the handle. Design – it features a 3-piece design. It also has a closed comb. It weighs 3.25 ounces. The stainless steel used to construct this unit gives it a great look. Shaving head – this can tilt to 45-degrees. Since most razors only can do 30 degrees, this is impressive. With this angle, it is easy to align it with your skin and shave without nicking and cutting yourself. Whether your skin is sensitive or not, you will find this razor to be perfect for your needs. The blades are extremely sharp, and yet the razor does not cause skin irritations. Though it is expensive, it proves to be a good long-term investment. If you are looking for one of the greatest options available today – this is the one to get. Merkur is one of the leading brand names in the industry. The company has been in existence for quite some time. During this time, it has continuously worked hard to perfect its safety razor design and construction skills. In addition, Merkur has learned to provide its clients with what they need. All razor solutions are designed to meet shaving needs. The Merkur adjustable safety razor is manufactured in Germany. It is made to be versatile and functional. With this unit, you can be sure to trim your forest of a chin mildly and without nicking yourself. Being a double-edged razor, you expect it to perform at the same level as other double-edged razors on the market. However, this Merkur razor shows most of the top grossing razors dust. After all, Merkur has been in the double-edged game since 1980. It is difficult to compete with such experience. Merkur Futur is designed with 6 adjustable settings. This razor can provide you with a mild shave or an aggressive shave. It all depends on the settings you engage. For a mild shave, the #1 setting is for you. For an aggressive shave, the #6 setting is the ultimate. With the 6th setting, you should be careful not to exert additional pressure. The weight of the razor will work just fine. With these settings, you do not have to have numerous razors. The Merkur Futur will cater to all your needs. Unlike most top grossing units, this razor is kind to newbies. Though it can be aggressive, its other settings allow new hands to make mistakes as they learn the shaving techniques. With this razor in hand, any newbie will feel like a pro. It is advisable to use the lower settings first before turning the razor to the 6th, most aggressive setting. It weighs 4.4 ounces. At this weight, it is probably the heaviest safety razor available. This weight allows one to achieve a clean shave without having to exert a lot of pressure. The weight is properly balanced and provides superior control as well as maneuverability. Merkur Futur adjustable safety razor is 4-inches long. Its handle is longer than that of most units; it is perfect for men with large hands. The longer handle provides such men with superior control. This safety razor’s handle is not knurled. Instead, and like many other safety razors today, it features a dent close to the top. This dent provides a better grip. Most safety razors are designed with screws to hold the blades tight and in place. This razor, however, features a clip. This clip is as effective as the screw. It has the added benefit of making the blade loading process a breeze. 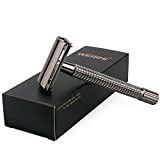 If you are looking to upgrade your shaving game, or at the very least keep it at its optimal point, you should go with the Merkur adjustable safety razor. Its versatility is hard to beat courtesy of the 6 blade settings and perfect finish. Gillette products dominate commercials. It will not be a shock if you have come across this razor. But if you are not a TV person, chances are you haven’t. But do not worry. This review will share some insight into everything you need to know. We will start off by saying Gillette is one of the most popular names in the shaving industry. They have been around for decades and dominated the market for a significant number of years. They have grown in popularity courtesy of their high-quality razors and the features they continually add to them. 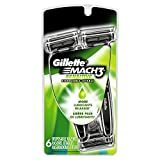 The Gillette Mach3 turbo is by far the top and most searched for razor available. Given that it has stiff competition and still manages to be at the top of the food chain, it is a big deal. Below is why this razor is creating such ripples and waves in the industry. The Mach3 Turbo is designed to provide a smooth and close shave. It does this without causing irritations. In this industry, a razor that can achieve this is a winner. The razor features 3 blades. Each of these is strategically positioned to ensure your facial hair is cut close. For every stroke you make, the razor makes 3 cuts – impressive right? Its blade is sharper in comparison to most disposable razors. Even after a few shaves, the blade is still sharp. The razor is designed with micro fins that go ahead of the blades and straighten out the skin and facial hairs. With this technology and design, you do not need to make 3 passes to achieve a close shave – one or two passes will do fine. At its top is a thin strip referred to as the Lubrastrip. This strip releases lubricants as you shave. The lubricant softens the facial hairs and allows for a smooth and easy gliding motion during a shave. After a while, the strip changes color to white. This is an indication that it needs to be changed. Has a metallic handle. The handle is lined with rubber grips designed to prevent it from slipping during a shave. Since you are reading this, it is safe to assume that you take your shaving seriously. This is commendable, and yes, grooming is not a thing you should joke around with. But if taking your shaving seriously is a big thing; you need to be ready to put your money where your mouth is. To back up your seriousness in shaving, you need to have a beast for a shaving tool. The Feather SS is exactly what you are looking for. Though it is a straight razor, and some may consider it as a basic shaving tool, it is sophisticated in more ways than one. Experienced wet shavers claim that it is the best replaceable blade shaving razor in the market. The process of changing its blades is easy. All you need to do is pinch its razor head, and the blade will pop out ready for replacement. The blades, on the other hand, are extremely sharp. The sharpness cannot be compared to any other unit. Japanese manufacturers are known for not taking shortcuts when it comes to quality and sharpness. The Feather SS features durable stainless steel construction. With such solid construction, you can expect the razor to last for years. The steel makes it heat resistant, and it is not worn out by impurities or chemicals over time. The handle features silicone resin. This resin, like the stainless steel, is heat resistant. It can withstand temperatures as high as 275 degrees Fahrenheit. In addition, the resin provides a strong grip. The head of the blade is spring mounted. This makes it easy for one to change the blade when the time comes. It features a smooth and black matte finish. It is beautiful. The shaving head is round. This provides the blade with sufficient exposure to provide a soft and smooth shave. If you are new to the game, using a straight razor will prove to be a challenge. This is because they require a bit of a learning curve. However, with the Feather SS, though you still have to go through the learning curve, it is easy to use it as it has superior grip and control. This will help you master the shaving art and technique in a comparatively short amount of time. This is the epitome of all shaving tools. Its design is synonymous with true craftsmanship, and the razor is in itself user-friendly. And now we introduce you to yet another quality Gillette razor. 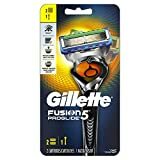 Just like its relative the Mach3 turbo, the Gillette Fusion5 ProGlide is a high-quality razor in the cartridge category. This unit is designed with lots of features all added to ensure that a superior shave is achieved. With regards to price, it is almost impossible to beat. It has the perfect combination of quality and price. The most notable feature of this unit is the Flexball technology. This technology allows the blade to automatically adjust to the contours on the face. It achieves a clean and smooth shave free of cuts. This razor has the option of using batteries. When battery powered, the microchip installed in the unit is activated to provide a consistent shave with every pass over your face. The option you choose entirely depends on your preference. We shall leave that choice to you (whether to use a battery operated razor or not). Using the batteries causes vibrations on the razor. These vibrations are used to provide a close and smooth shave by reducing the level of friction and increasing the razors glide over the skin. After 8 minutes of use, the unit turns off automatically. This feature is useful in ensuring that the unit is not accidentally turned on and runs until the battery runs dry. Speaking of the battery, whether it is new or old, you will receive the same level and power of vibrations. As the unit is used and the battery is spent, the power of the vibration does not reduce. The razors blade feature advanced tech coating. Coupled with the Flexball Technology, they are super effective in comparison to regular blades. They are also finer and thinner than most blades and reduce pulling and tugging. 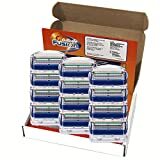 If you prefer cartridge razors, then you will find Gillette Fusion5 ProGlide to be great. It is not only innovative but also features the latest razor technology designed to provide you with the best experience. Schick, the brand, did not hold anything back when designing and creating the Hydro 5 Power Select. If you are looking for a razor with battery power options and that has variable settings, then this is the razor for you. Schick outdoes itself with this unit. The Hydro 5 Power is designed to give its competition a run for their money. This unit can handle pretty much anything. The brand has been in existence since 1926. Given the years of experience, it is safe to say that they have honed their manufacturing skills and provides a razor that will give a consistently great shave. This razor, as hinted in its name, features 5 blades. These blades are included to ensure a close shave. For those working with extra sensitive skin, this Hydro blade proves to be among the best. Courtesy to the 5 blades, the shaving process will be fast – fewer strokes will be needed. At the top of each blade are skin guards. These are designed to help reduce friction. Now, the gel reservoir in the unit lubricates the razor more. The gel reservoir is more efficient compared to the lube strips other units feature. Schick claims friction reduction of about 40%. What is more, the razor contains a guard bar. This bar is intended to stretch the skin prior to the slicing of facial hair. This results in a super smooth shave. To help you reach the hard to trim areas, the Hydro 5 features a flip trimmer. By the flip of the thumb, you switch the razor to its trimming mode. Last but not least, the unit has an ergonomically designed handle. It proves easy to grip. The Schick Hydro 5 has lots of unique features. These are designed to help you enjoy a quality smooth shave. If you have sensitive skin, this razor has got you covered. Yes, Merkur has plenty of options to choose from. Here is yet another great razor from this top brand. With many of its products making it at the top of razor reviews, it is safe to assume that Merkur is doing something right. The Merkur 34c heavy duty classic proves to be great for newcomers in the game as it is simple to use. In addition, the razor is known for being easy on sensitive skin. It is not super aggressive, but it will nonetheless, provide you with a smooth and close shave. To top it all off, the razor is affordable. At an affordable price, you get a high-quality razor. No, we are not saying that it is cheap, but comparing its price tag to its features and quality, it is one of a kind. This razor is a 2-piece. It is not adjustable, and it features a single blade. It comes with a chrome plated finish. It is classy and beautiful. This helps this unit to meet high industry standards. The classic double edge safety razor is light. Its weight is lower than that of most razors making it is easier to handle. It features a consistent blade alignment. This is a plus for those with sensitive skin. This is perfect for experts and beginners alike. The Merkur Heavy Duty Classic fetches a great price considering its high-end craftsmanship. With this unit, you can achieve a great shave without worrying much about getting cuts. Dorco is not one of the most popular brands available. However, it does hold its own against its competition. It is a South Korean company and not yet so well known internationally. But despite its low key reputation, the company is still making major ripples in the industry. As a matter of fact, many respect the brand for producing razors like the Pace 6 Plus. This is the very first 6-blade shaving razor available. It is shocking, right? How can a razor possibly have 6 blades? Well, it is possible. Think about it. The more blades a razor features, the fewer passes one would have to make to achieve a clean and smooth shave. In addition to this, it should be noted that Dorco Pace 6 Plus is affordable. 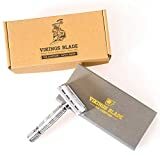 Its price is perfect for individuals looking for a great shaving experience but working with a limited budget – those testing the waters working with top end tools. It features a head that can be tilted. This helps to increase the precision of the unit on every contour no the face. It does all this while reducing nicks, cuts, and irritations. Features a lubricating strip soaked in lavender oil, vitamin E, and aloe. It proves easy to clean and also rinse. This is courtesy of the open flow design. The design also works to reduce corrosion and improves the blade’s durability. The razor comes with guaranteed 100% durability. If anything is wrong with your purchase, you can always contact Dorco, and they will be sure to fix it for you. It features a high-end handle design. The handle is covered with rubber for a secure grip. The razor features an ergonomic design. This makes it easier for one to maneuver and glide the blades on the face. It is an impressive razor. It features 6 blades – the first of its kind. Overall, it is a high-quality razor designed to get the job done in the least time possible. In this section, we share some important tips that will help you achieve that smooth and close shave with ease. The following process will reduce the chances of you nicking or cutting your skin. To achieve an irritation-free have, you should start with wetting the hair. Wet facial hair is not only moist but soft too. If you don’t have the time to take a shower or use a face wash or cleanser, you can use a wet towel or splash warm water on your facial hair. Shaving creams are designed to provide lubrication. They are necessary to achieve a smooth and clean shave. That said, you should pay attention to the quality of shaving cream you choose. The shaving cream you purchase should provide you with a creamy and rich lather. Additionally, it should produce less foam. A lot of foam does not mean that the cream is effective. Foam is usually just for show. It is the cream on your skin that makes all the difference. Shaving creams are designed to also retain moisture and maintain the softness of facial hair during the shaving process. When applying your shaving cream (or soap), you can use a circular motion with an upward stroke. Since we have spent a long time explaining this, there is no need to get into the details here. All we can say is that you should always ensure the blade is sharp. Change your blades as soon as you notice they have grown dull. Always shave along the grain. Shaving against the grain increases your chances of nicking and cutting yourself. It also causes ingrown hairs. Start with the sides and work your way to your mustache. You should always finish with your chin. The chin hairs are handled last as they are tougher and as such, need some extra time to achieve a clean shave. Exercise gentleness. High-end razors are usually more aggressive in comparison to cheaper ones. With these razors, you should not exert additional pressure. Make use of their weight. Rinse. Use warm water to rinse your face. You can also use a facial wash to cleanse your skin. Once this is done, use cool water to help soothe the skin. Pat your face dry, apply either an aftershave or at least a face moisturizer and you are done. Here is the thing. Using a straight razor is a little more complex. It needs an entire article to explain it in details and comprehensively. For this, click here for a step-by-step guide of how you can use straight razors to shave. Like with everything we do, research is important. We take it upon ourselves to try out the razors we recommend. Additionally, we do in-depth research, consult professionals and past clients to have a comprehensive idea of how the units work and what is special about them. You can trust the reviews provided above. I think that our selection will fit most men’s needs and preferences and that you will find one that will fit your personal needs here. If you like the best men’s razor list and the products provided, make a point of reaching out to us. If you feel we have left out something, be sure to communicate the same as well. We love getting your feedback.